Der alte West Begriff... - BODENEHR, G.
Size : 5.8 x 5.1 inches. / 14.8 x 13.0 cm. 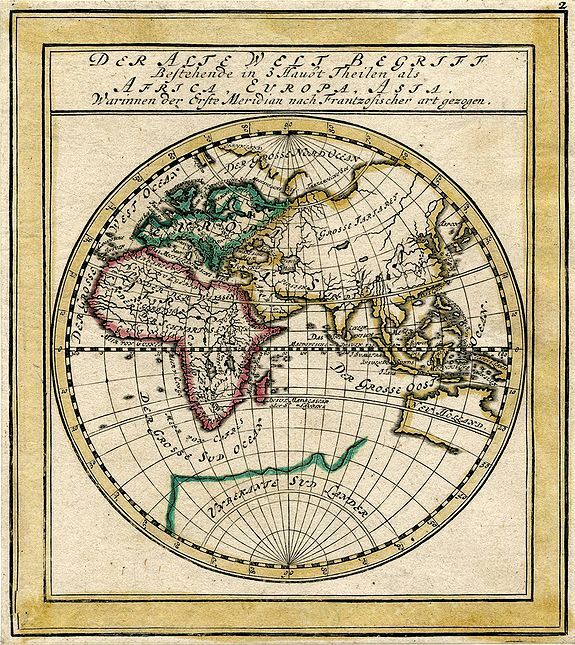 Description :Attractive German miniature map of the Eastern Hemisphere - the old World - extending from Iceland to Far East Asia and Australia. With some curious shaped areas. Australia is shown with unfinished coast line, the South Pole is indicated as "unknown southern lands". Numerous regions, islands, and seas are named. A charming and interesting map with decorative outline colouring. Condition : Hand-laid paper pleasantly age-toned. Very good impression. Some light soiling and paper thinning! Narrow margins. Attractive color.